How does the American auto icon stack up against the German luxury giant? For long-term-minded investors, that pressure creates some opportunities. 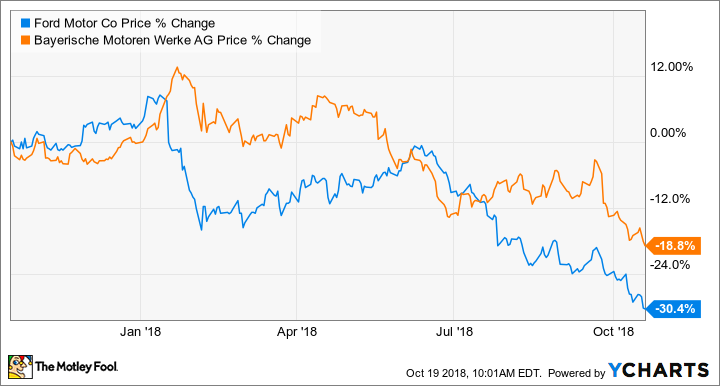 Both Ford Motor Company (NYSE:F) and BMW -- or Bayerische Motoren Werke AG (NASDAQOTH:BMWYY) -- drew investors' attention earlier in the cycle, when sales and profits were growing and their management teams appeared to be executing better than most. But shares of both companies have since fallen into slumps, as investors worry about declining profits and traditional automakers' ability to compete as new technologies transform the industries. BMW has chosen to develop its self-driving system with a team of partners, including Intel (NASDAQ:INTC) and Aptiv (NYSE:APTV), and expects to launch its first vehicle with self-driving capabilities -- an advanced luxury crossover SUV -- around 2021. BMW has warned that its profit margins will be squeezed a bit over the next few years by the investments necessary to support its research and development efforts. It has been adding high-margin SUV models to its portfolio to help offset the costs.